The word totem comes from Ojibwe, an Indigenous language of North America, and indicated a spirit being or sacred object. 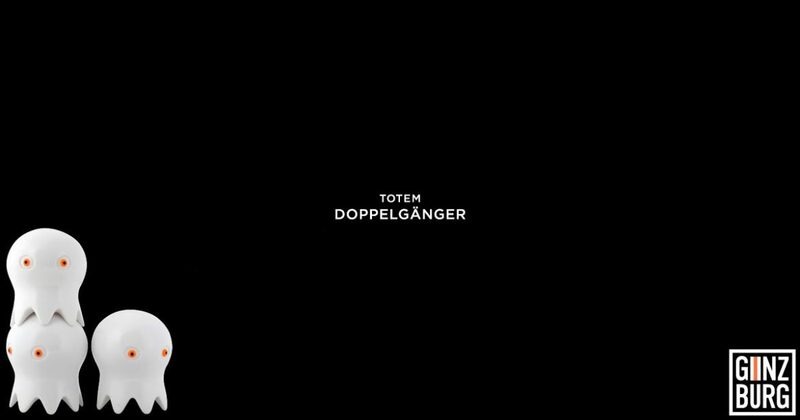 Merging these meanings together, Russian born, New York-based artist Anton Ginzburg created the Totemdoppelgänger, or Totem Doppelganger, a stacked series of ghostly forms that resembles a monumental totem pole carving. Eventually issued in a miniaturized vinyl rendition by Kidrobot, Ginzburg’s design was first exhibited as a unique installation piece in 2005. Inspired by Ginzburg’s recollection of a cartoon ghost from East German stickers in the 1980s, these enlarged and repeated forms of a person’s posthumous double treaded between being sacred and profane. Incorporating a reference to another of his works, the Haunted Circle (2005) seen behind Totemdoppelgänger in the pictures below, the chained marker hanging from the nail implies a ritual circle yet to be drawn. Featured as part of the then-largest contemporary art event ever staged in Russia, the 1st Moscow Biennale, Ginzburg’s Totemdoppelgänger was part of the Olga Kopenkina curated Post-Diasporas: Voyages and Missions special project display at the Moscow Museum of Modern Art. Exhibited for one month starting on January 28th, 2005, the roughly 6½-foot tall Totemdoppelgänger sculpture was composed of plastic, metal, glass, and high-density foam tiles. And, a little over two years later, these spirit depictions would return in a smaller form. Reimagined in soft vinyl at an approximately 3-inch tall size, Ginzburg’s Totem Doppelganger sculpture sets were issued by Kidrobot on April 5th, 2007. Cast in a pliable plastic that allowed the three spectral caricatures in these sets to be stackable, each individual piece was an identical rendition of the original’s wide-eyed forms. Originally offered strictly in trios of glossy white, it wasn’t long before some intrepid collectors were using Rit Dye to create colorful collections of these pieces. And while a smart concept, it was one that would become slightly moot when new color schemes were offered in July 2009. This second wave of the soft vinyl sculptures from Ginzburg and Kidrobot included not only a reissuing of the glossy white rendition but also black and glow-in-the-dark pink versions. To complete the evolution for these new editions, the minimal paint applications on the pupils and irises were altered to be complimentary to base’s colorations. And for those that weren’t satisfied with only three color options, they would be given a plethora to choose from only months later. Issued in September of 2009, Ginzburg and Kidrobot miniaturized the form again, creating the roughly 1¾-inch tall miniTotem Doppelganger series. Featuring a selection of fourteen colorful renditions, including the less common black, white, and clear versions, this assortment was offered randomly within sealed box packaging. Allowing one to amass a more vibrant selection to create a Totem Doppelganger assemblage from, this final factory-produced iteration remains a beautiful invitation from the artist with Ginzburg allowing the collector to construct a sculpture imbued with their own personal aesthetic and significance.